Rivals! 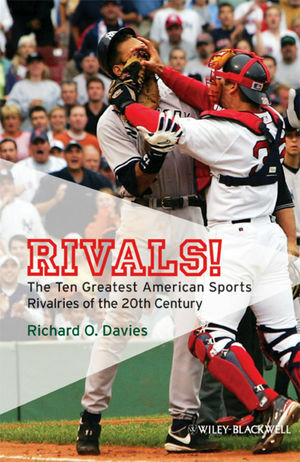 The Ten Greatest American Sports Rivalries of the 20th Century presents the most memorable rivalries in over a hundred years of American sports history. Richard O. Davies is Distinguished Professor of History at the University of Nevada, Reno, where he teaches courses in 20th-century American History, American Ideas and Values, and the History of American Sports. His books include Main Street Blues: The Decline of Small-Town America (1998), America’s Obsession: Sports and Society Since 1945 (1994), Betting the Line: Sports Wagering in American Life (2001), and Sports in American Life: A History (Wiley-Blackwell, 2007). 1 Fight Fiercely: Harvard and Yale Create the First Great Football Rivalry. 2 "We Hate Each Other's Guts": The Dodgers and the Giants. 3 Battle Along Tobacco Road: Duke and North Carolina Basketball. 4 Mayhem on the Midway: The Bears and the Packers. 5 Shootin' Irons: The Jack Nicklaus-Arnold Palmer Golf Rivalry. 6 Cross-Country Conflict: The Celtics and the Lakers. 7 The Bull and the Butterfly: The Never-Ending Rivalry Between Joe Frazier and Muhammad Ali. 8 Friendly Foes: Chrissie and Martina. 9 "Dearest Enemies": Michigan-Ohio State Football. 10 East Coast Baseball Rivalry: The Red Sox and the Yankees.